Xerafy Mercury Metal Skin UHF RFID Tags PrintableThermal Transfer Label is a revolutionary RFID smart label that works on both metallic and non- metallic assets. The label can incorporate human readable printing, barcodes, and graphics and s extremely low profile and flexible to fit curved surfaces such as the contour of metallic cylinders and drums. Globally compliant to EPCglobal UHF Gen2 and ISO 18000-6C standards, the Metal Skin is cost effective and versatile for a wide range of applications from product authentication and IT asset tracking, to global tracking of assets shipped and anti- counterfeiting of high value items and medical supplies. Xerafy Mercury Metal Skin Label is a versatile on-and-off metal label that can be printed on and encoded through an RFID printer. 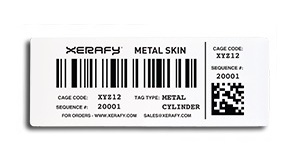 Xerafy Mercury Metal Skin Label can be used with the following UHF RFID Thermal Transfer printers: Zebra RZ400, SATO CL4NX, SATO GT412e, and the Toshiba B-SX5T, and Toshiba SX4T. • Versatile on-and-off metal tag. • Perfect for IT asset tracking. *This product utilizes an Impinj M4 series chip; each tag will have the exact same EPC number and a unique TID number. Xerafy will verify the Read/Write function of each chip memory before shipment. Xerafy Mercury Metal Skin UHF RFID Tag Thermal Transfer Label/Tag, Impinj Monza 4E, 866-868 MHz (EU), Size: 101.6mm x 38mm x 0.76mm. MoQ-500 - EPC Class 1 Gen 2 (ISO18000-6C), 496 EPC bits, 128 bits user memory, 48-bit serialized TID, Thermal Transfer Printable face-stock, high-temp adhesive. Suitable for Product authentication, IT asset tracking, global supply chain, cylinder tracking, foil-based packaging. MoQ 500 per box. Xerafy Mercury Metal Skin UHF RFID Tag Thermal Transfer Label/Tag, Impinj Monza 4E, 866-868 MHz (EU), Size: 101.6mm x 38mm x 0.76mm. MoQ-400 - EPC Class 1 Gen 2 (ISO18000-6C), 496 EPC bits, 128 bits user memory, 48-bit serialized TID, Thermal Transfer Printable face-stock, high-temp adhesive. Suitable for Product authentication, IT asset tracking, global supply chain, cylinder tracking, foil-based packaging. MoQ-400 per box. Xerafy Mercury Metal Skin UHF RFID Tag Thermal Transfer Label/Tag, Impinj Monza 4E, 866-868 MHz (EU), Size: 101.6mm x 38mm x 0.76mm. MoQ-300 - EPC Class 1 Gen 2 (ISO18000-6C), 496 EPC bits, 128 bits user memory, 48-bit serialized TID, Thermal Transfer Printable face-stock, high-temp adhesive. Suitable for Product authentication, IT asset tracking, global supply chain, cylinder tracking, foil-based packaging. MoQ-300 per box. Xerafy Mercury Metal Skin UHF RFID Tag Thermal Transfer Label/Tag, Impinj Monza 4E, 866-868 MHz (EU), Size: 101.6mm x 38mm x 0.76mm. MoQ-200 - EPC Class 1 Gen 2 (ISO18000-6C), 496 EPC bits, 128 bits user memory, 48-bit serialized TID, Thermal Transfer Printable face-stock, high-temp adhesive. Suitable for Product authentication, IT asset tracking, global supply chain, cylinder tracking, foil-based packaging. MoQ-200 per box. Xerafy Mercury Metal Skin UHF RFID Tag Thermal Transfer Label/Tag, Impinj Monza 4E, 866-868 MHz (EU), Size: 101.6mm x 38mm x 0.76mm. MoQ-100 - EPC Class 1 Gen 2 (ISO18000-6C), 496 EPC bits, 128 bits user memory, 48-bit serialized TID, Thermal Transfer Printable face-stock, high-temp adhesive. Suitable for Product authentication, IT asset tracking, global supply chain, cylinder tracking, foil-based packaging. MoQ-100 per box. Xerafy Mercury Metal Skin UHF RFID Tag Thermal Transfer Label/Tag, Impinj Monza 4E, 866-868 MHz (EU), Size: 101.6mm x 38mm x 0.76mm. MoQ-50 - EPC Class 1 Gen 2 (ISO18000-6C), 496 EPC bits, 128 bits user memory, 48-bit serialized TID, Thermal Transfer Printable face-stock, high-temp adhesive. Suitable for Product authentication, IT asset tracking, global supply chain, cylinder tracking, foil-based packaging. MoQ-50 per box. Xerafy Mercury Metal Skin UHF RFID Tag Thermal Transfer Label/Tag, Impinj Monza 4E, 902-928 MHz (US), Size: 101.6mm x 38mm x 0.76mm. MoQ-500 - EPC Class 1 Gen 2 (ISO18000-6C), 496 EPC bits, 128 bits user memory, 48-bit serialized TID, Thermal transfer Printable face-stock, high-temp adhesive. Suitable for Product authentication, IT asset tracking, global supply chain, cylinder tracking, foil-based packaging. MoQ-500 per Box. Xerafy Mercury Metal Skin UHF RFID Tag Thermal Transfer Label/Tag, Impinj Monza 4E, 902-928 MHz (US), Size: 101.6mm x 38mm x 0.76mm. MoQ-400 - EPC Class 1 Gen 2 (ISO18000-6C), 496 EPC bits, 128 bits user memory, 48-bit serialized TID, Thermal transfer Printable face-stock, high-temp adhesive. Suitable for Product authentication, IT asset tracking, global supply chain, cylinder tracking, foil-based packaging. MoQ-400 per Box. Xerafy Mercury Metal Skin UHF RFID Tag Thermal Transfer Label/Tag, Impinj Monza 4E, 902-928 MHz (US), Size: 101.6mm x 38mm x 0.76mm. MoQ-300 - EPC Class 1 Gen 2 (ISO18000-6C), 496 EPC bits, 128 bits user memory, 48-bit serialized TID, Thermal transfer Printable face-stock, high-temp adhesive. Suitable for Product authentication, IT asset tracking, global supply chain, cylinder tracking, foil-based packaging. MoQ-300 per Box. Xerafy Mercury Metal Skin UHF RFID Tag Thermal Transfer Label/Tag, Impinj Monza 4E, 902-928 MHz (US), Size: 101.6mm x 38mm x 0.76mm. MoQ-200 - EPC Class 1 Gen 2 (ISO18000-6C), 496 EPC bits, 128 bits user memory, 48-bit serialized TID, Thermal transfer Printable face-stock, high-temp adhesive. Suitable for Product authentication, IT asset tracking, global supply chain, cylinder tracking, foil-based packaging. MoQ-200 per Box. Xerafy Mercury Metal Skin UHF RFID Tag Thermal Transfer Label/Tag, Impinj Monza 4E, 902-928 MHz (US), Size: 101.6mm x 38mm x 0.76mm. MoQ-100 - EPC Class 1 Gen 2 (ISO18000-6C), 496 EPC bits, 128 bits user memory, 48-bit serialized TID, Thermal transfer Printable face-stock, high-temp adhesive. Suitable for Product authentication, IT asset tracking, global supply chain, cylinder tracking, foil-based packaging. MoQ-100 per Box. Xerafy Mercury Metal Skin UHF RFID Tag Thermal Transfer Label/Tag, Impinj Monza 4E, 902-928 MHz (US), Size: 101.6mm x 38mm x 0.76mm. MoQ-500 - EPC Class 1 Gen 2 (ISO18000-6C), 496 EPC bits, 128 bits user memory, 48-bit serialized TID, Thermal transfer Printable face-stock, high-temp adhesive. Suitable for Product authentication, IT asset tracking, global supply chain, cylinder tracking, foil-based packaging. MoQ-50 per Box.